YA HA WO 13 - 'PENETRATION' CD !OUT NOW! Were pleased to announce the long awaited re-issue of the classic Ya Ho Wa 13 recording "Penetration" is out now on Cold Sweat Records. 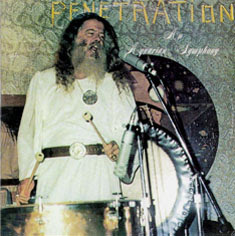 For those unfamiliar, Easily one of Ya Ho Wha's heaviest offerings, "Penetration, An Aquarian Symphony" is arguably revered as their best -- one of the finest sacred, psychedelic death trips of all time, for sure. Djin's tripped out guitar work coupled with Zinuru's soundscapes and Father Yod's bellowing moans and chants create some of the most intensely spiritual and epic passages put to tape. It was 1972, time of the cult-occult-commune explosion. By day, the Source Family served organic cuisine to John Lennon, Julie Christie, Frank Zappa and others at the famed Source restaurant. By night, in a mansion in Hollywood Hills, they explored the cosmos through the channeled wisdom of their charismatic leader, Father Yod. Father was an outlandish figure who had 14 "spiritual wives," drove a Rolls-Royce, and fronted the rock band Ya Ho Wa 13, now considered by collectors to be one of the most singular psychedelic bands of all time.